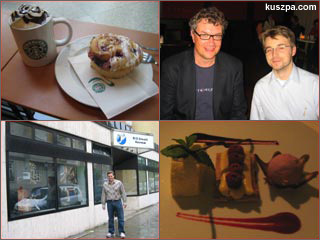 Markus Kling, Starbucks, Russell Buckley an me, my flagitious dessert. Later on we also met Russell (admob.com) and went to the restaurant „Blauer Bock“ for an elaborate dinner. They have a manageable (4 starter and 5 main courses), but very delicious menu for high demands. My culinary highlight was the flagitious dessert „Mus von der Ivoire-Schokolade, Himbeer-Mille-feuilles“ (I have no idea how to translate it, – but you can see it on the picture above).